Plains Mennonite Church has added a Free Mini Library in their Peace Park. Built from an old pew bench, this unique library invites you to take a book to read and leave a book for someone else to read. The idea originated in Wisconsin when Todd Bol wanted to honor his mother, a former teacher and book lover. He built a unique tiny library, placed it in his front yard, and the surrounding neighborhood loved it. The idea took hold and today, Little Free Libraries can be found in at least 24 states and eight countries. 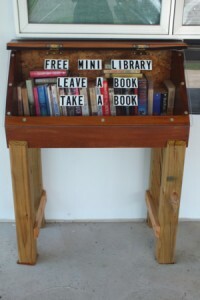 In a nutshell the basic concept of these mini libraries is to take a book and leave a book. Learn more on his website, littlefreelibrary.org. You Are Welcome July 4 Picnic ~ Join us to celebrate our diverse community! Click here for details. Wednesday, July 4, 11 a.m. – 3 p.m. with a potluck lunch from 12-2 p.m. Please share your culture by bringing a food item for lunch.